Controversial documentary maker Michael Moore will soon become a Cuban citizen. Moore announced his plans announced his plans Sunday night at an Academy Awards after-party, stating that he has lost faith in America and wishes to relocate to a country that truly shares his ideals on socialism. In an exclusive interview with Ponderings from Pluto, Moore told C.F. Twob that, effective April 2, he will no longer be an American citizen but will instead become a Cuban citizen. He also will legally change his name from Michael Francis Moore to Miguel Francisco Moreno De La Ciudad De Banderas. The phrase at the end of his Spanish-ified name translates as “Of the city of flags”, a reference to Davison, Michigan, where Moore actually grew up. The documentarian was born 10 miles east in Flint in 1954. Moore’s latest documentary on U.S. healthcare, Sicko, failed to win the Academy Award. 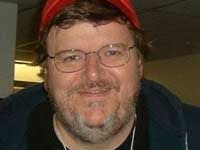 Moore previously won an Oscar for his documentary Bowling for Columbine, during which he gave a speech criticizing President George W. Bush, amid a noticeable spatter of boos. Raul Castro, the brother of longtime Cuban president Fidel Castro, could not be reached by PFP for comment. However, the new Cuban president is said to be delighted about Moore’s decision and has reportedly promised to name Moore the director of the Ministry of Entertainment. It is unclear whether Moore’s wife, Kathleen, and their child will be joining him in Cuba. Moore has been recently living in Bellaire, Mich. (about 40 miles northeast of Traverse City, Mich). The old question “What’s in a name?” is certain to be re-examined with the filing of an unusual lawsuit. The class-action lawsuit, filed on behalf of the cities of Boston, Denver, Miami and Bay City, Mich. along with the states of Kansas, Alabama and Georgia seeks an estimated $12.5 billion in damages from the rock groups Boston, Bay City Rollers and Kansas, Latino group Miami Sound Machine and the country music bands Alabama and the Georgia Satellites. It also seeks damages from the estate of folk singer John Denver, who died in 1997. Boston mayor Thomas M. Menino told Ponderings from Pluto that the lawsuit came about as a result of the recent actions of the rock group Boston’s guitarist and songwriter Tom Scholz. Scholz had publicly requested that Republican presidential hopeful Mike Huckabee no longer use any of Boston’s songs in his campaign. The musician stated that the band has never endorsed a candidate, but that he supports Democratic frontrunner Barack Obama. Boston has released six albums that have sold a combined 30 million copies. The class-action lawsuit, filed on behalf of the cities of Boston, Denver, Miami and Bay City, Mich. along with the states of Kansas, Alabama and Georgia seeks an estimated $12.5 billion in damages from the rock groups Boston, Bay City Rollers and Kansas, Latino group Miami Sound Machine and the country music band Alabama. It also seeks damages from the estate of folk singer John Denver, who died in 1997. Michigan-based attorney Sam Bernstein, who’s heading a team of a dozen attorneys representing the four cities and two states, says that the plaintiffs simply want to be properly compensated for the names of their cities and states being used without authorization. Officials of the world’s second-largest hamburger fast food chain have announced plans to branch out to a new fast food chain that focuses on seafood. Brian Thomas Swette, chairman of the Miami-based Burger King, told Ponderings from Pluto that starting in Summer 2009 they will be launching 50 franchises of Sushi King across America. If the seafood restaurant is successful, they will expand it globally. Plans currently are to locate Sushi King in waterfront or near-waterfront cities like Miami, Houston, New York, San Diego, Los Angeles, San Francisco and Seattle. The new restaurant, like its name suggests, will specialize in sushi, or raw fish. Swette said that with the restaurants located on or near the ocean, it’ll mean being able to acquire sushi products faster and fresher. Sushi King is still testing out slogans, Swette said, declining to say which ones are being considered. He did say, though, that their logo would be similar to Burger King’s except for additional aquatic graphics designed to give it its own identity. The chairman also denied reports that celebrity chef Masaharu Morimoto, who specializes in Neo-Japanese cuisine and has his own restaurants in New York and Philadelphia, has been privately serving as a consultant for the company regarding this venture. You are currently browsing the Ponderings from Pluto blog archives for February, 2008.